GB: First of all, how is Dungeon Siege II coming along, and are you still on track for a 2004 release date? Any recent milestones or obstacles you'd like to elaborate on? Kevin: DS2 is coming along great. GPG is committed to releasing titles that meet a strict internal quality bar. Our schedule is tight but we're confident that we'll have an awesome game come spring 2005. GB: Can you detail the different character advancement options that you're adding in the sequel (powers, skills, etc)? How much more customization freedom will players have for their characters? Kevin: Rather than create new character classes, we've taken the original four character classes from the first Dungeon Siege and added considerable depth to each of them in the form of skills and powers. This allows players to choose not only their character class, but also what 'type' of fighter, ranger, or mage they'd like to be. For example, players may choose to be a ranger specializing in bows and crossbows or thrown weapons by spending skill points in the appropriate skills. The decision of how to spend skill points when a character levels up and which powers to get puts a lot of freedom in the hands of players when deciding how a character should progress. GB: The Packmule was a very popular aspect of the original game. What other types of pets are you planning to implement into the sequel, and how many might we see? Will these pets have other useful skills aside from carrying extra items? Kevin: We currently have 9 pets in the game and each pet has a particular specialty. A packmule will be good for players who want a lot of convenience in acquiring and carrying loot, whereas players who enjoy burning enemies to a crisp might prefer a fire elemental. GB: During E3, we were shown how some creatures in the game will protect their leader at all costs and how others will lead the player into an ambush. Can you tell us more about such AI enhancements and how these enhancements will affect the combat of the game? Kevin: We call that the 'leader guard play' and it's just one example of the fruits of our new Coach AI system. The Coach AI system, like its name suggests, allows the designers to create 'plays' where monsters have a plan of action just like players would in a football game. 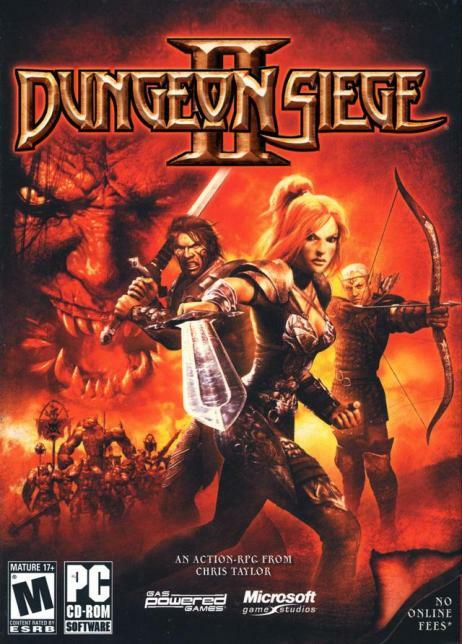 Between the plays used by the Coach AI system and the interactive sequences created by the level designers, the combat in Dungeon Siege II will give players a lot to sink their teeth into. GB: Will we be seeing more "boss" enemies in Dungeon Siege II than in the original game? Any particular ones you can tell us about? Kevin: Unfortunately I can't really talk about our boss battles other than to say that they will be much more elaborate than the bosses in the first Dungeon Siege. Also, we've added way more mini-bosses this time around.